One of the ways young adults get into trouble these days is with their finances. Schools are woefully inept at teaching personal financial planning, and most parents also don’t have a clue these days. If I had to bet, most people are living paycheck to paycheck today, so it’s harder to think long term. But, think long term you must if you want to teach your teenager money skills. 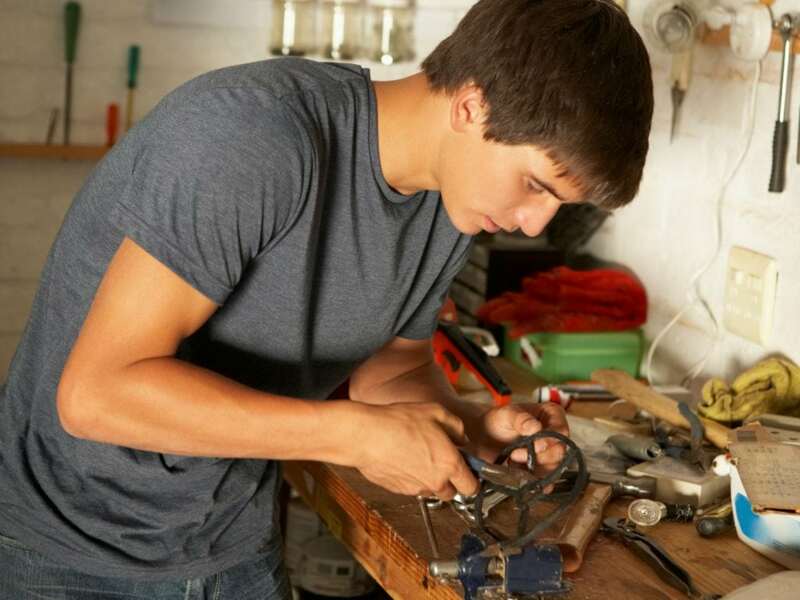 Here are 9 important money skills all parents should teach their teenagers. A lot of parents are afraid to let their teenagers work. However, studies show that teenagers who have jobs of up to 19 hours a week actually get better grades and are more likely to get a secondary education. Plus, it looks good on their college applications. It is also teaching them time management of balancing work with school. When your teenager gets a job, you should get them their own checking account. Until they’re 18 (19 in some states) they’ll be part of your account, in that you’ll be a signer on their account and if they overdraft the money you are responsible. Opening their own checking account, then working with them to do their bank statement monthly is a good way for them to learn money management skills. But don’t be surprised they overdraft the account a few times. Teach them to set aside some money each week into a savings account separate from their checking. Even if your child has a job, giving them an allowance is a good thing. You don’t want to give them “free money” however. The money you give your teen should be money you would spend on school lunches, activities, personal hygiene products, and clothing. So, whatever you’ve budgeted for these items, give directly to your teen and let them budget the money to get these things. The trick is not to bail them out when and if they mess up. Dave Ramsey shares his thoughts on kids’ allowance and chores in this article. When you give them free reign on their own money, and help them work out a budget to start, they will learn money management skills that will carry them far into their adult life. So, if your child has a car payment, insurance, a cell phone, clothing, school supplies, etc.. Put this all into their budget and then let them take care of it. Check up each month to make sure they’re on track, but mostly stay hands off once you show them so they can learn. When you’ve given them an allowance to cover the things you normally pay directly for, and they have a job, along with their own checking account they will now learn how to pay their own bills. This is a great skill to have because so many young adults go out into the world having no idea about these things. Your child will be head of the pack. It might be a good practice to show them a sample budget for when they have their own place too so they understand about water, electric, trash, rent and other types of bills they do not have now. Part of managing money should also include how to save and invest their money. A portion of their money, probably at least 10 percent should be saved in both short term and long term savings accounts. You can even teach them how to start a 401K, which will truly set them ahead of their peers when they move out on their own. Credit today is truly a dangerous thing. Some credit cards are being offered that charge more than 50 percent interest. Plus, the credit card companies prey on young people by sending more than one or two offers to them daily once they reach the age that it’s legal, usually college age. Teaching them how this works is imperative so they can see what a trap it can become if they’re not wise and careful. Letting a teenager handle their own money will teach them wise spending habits. This is most especially true if you do not bail them out when they make a mistake. For example, if your child knew that prom was coming up but did not plan for the expense, don’t give them the extra money. It can be a hard line to take, but as long as you explain everything when you first give it all over to them, they’re going to learn fast. Finally, and this is a big one. Don’t hide your finances form your children. So many parents see this as personal information and while it is to a point, teenagers really do need to know how hard you work to provide what you provide. If they understand it more, and get how much work goes into having that meal on the table each night their wants will become a lot more realistic as they get older. Spend time teaching your teenager these important money skills to set them up for future success.